1.install the transmitter to the desk, and use micro USB cable and adapter or standard USB to supply power to the charger. 2.Slowly drop the phone to the charging area. 4.if you want to charge your phone wirely,please push the cover on the product surface and contect a cable to USB port,then the charging will start. 2.Works for any devices that support WPC-wireless charging from Samsung, HUAWEI, LG, HTC and Blackberry etc. 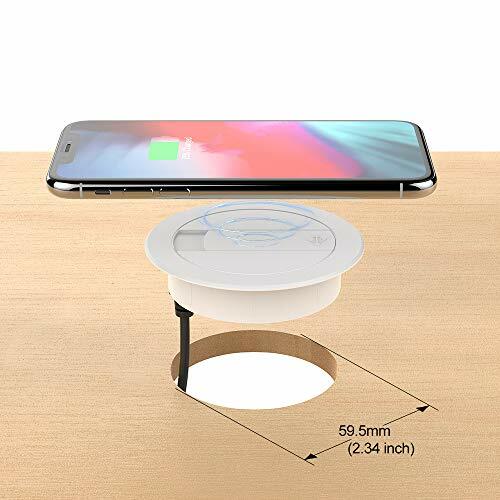 3.Simply place your device that is capable for wireless charging. We are committed to customer satisfaction 100%. Our customer service team will gladly, any inquiry or questions please feel free to contact us. We respond to all emails within 24 hours. All customer interactions will be handled in a professional and expedient manner. if you're unsatisfied with this item for any reason in 18 months, we'll immediately send you a replacement or give you refund with shipping fee included.